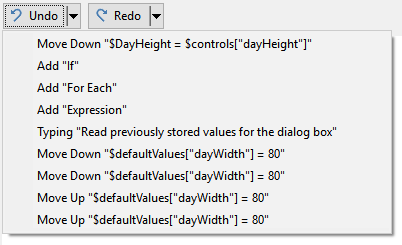 The undo history menus can be used to perform multiple undo steps at once. Just click on one of the recent items to undo all operations up to and including that operation. Undo/Redo feature is available under Onetastic Dev License. I see that there is a macro for Search & Replace. Looking through it with the Macro Editor I see the QueryText built-in function, so I'm curious if Regular Expressions are possible as part of this built-in. Interested in generating some macros, but I already know that I need RegEx to pull off what I have in mind. Does anyone know of an automated solution to either move pages placed in a section to another notebook's designated section OR sync a section from a notebook to a designated section in another notebook. Better yet, both. Notebook 1 section a - is synced with Notebook 2 section c.
@OmerAtay: Hello, I was recently developing a macro for onetastic and it appears that the QueryText() function doesn't check for string equality. It looks to me like the function just checks if the given string exists within the text of the provided object. I want to ask you if is possible to make a macro for change the color of a one page tab (not a all section) in OneNote ?